A friend of mine, with whom I drink some strong coffee and grapple with the world's dilemmas every Thursday morning — which explains why, as you no doubt have noticed, many vexing global and local problems are suddenly and mysteriously resolved on that day each week — told me recently about his strange encounter. He was walking along a city footpath, approaching a busy intersection, when he noticed an elderly woman standing at the traffic lights, which were showing green. She looked uncertain and distressed. When, hesitantly, he asked her if she needed help, she replied that she didn't know where she was. It was immediately obvious to my friend that she didn't mean she was simply having trouble with directions — this street or that? left or right? — but that she had no idea where she was or how she'd got there. Compounding his feeling of helplessness with a nervous politeness, he said, 'Perhaps if you tell me your name ...? Or do you have a phone number I could ring for you?' But she didn't know her name and she couldn't remember a phone number that might be useful or, indeed, any phone number. The traffic lights flicked through their cycles, cars and buses and trucks crossed and passed in long impatient queues, motors ticked or growled, a fire truck went wow-wow-wowing on its urgent business, and the two people continued to stand in silent bewilderment at the corner, the one irresolute, the other profoundly lost. And just when my friend was thinking to find a quieter place for her while he worked out what to do next, she turned to him, her face alight. With one deft movement she opened her mouth, removed her denture and held it towards him. On the 'gum' was clearly inscribed her name and a phone number. It was a strange business — a sort of happy ending undercut by the heart-rending reality of the woman's plight, her disorientation in a world she once knew, her severance from a past she once owned, and the reasonable certainty that things were not going to get any better for her. For all that, it's impossible not to see the comic potential of the scene, someone whipping out dentures to prove identity — identitures — yet impossible also not to feel callous and guilty in doing so. There but for the grace of God, etc., a grace which, in the future perhaps, may be withdrawn, leaving me or you or that loved one or some relative as much adrift and dependent as the woman rescued temporarily by my friend. A certain amount of forgetfulness or disorientation has always figured among the expected, dubious gifts of ageing. In our time and in our country the aged are very much with us — they are economically, commercially, medically, numerically and intellectually significant to an unprecedented degree. Accordingly, the phenomenon of age has entered public and political discourse, along with all its advantages — evanescent though many of them sometimes appear and, with the wonderful exception of grandchildren, often are — and its disadvantages, which seem innumerable and irremediable. It has also entered the world of our humour. Most of us know, have laughed at and possibly told, jokes about dementia. It's a kind of defence, like telling jokes in a lifeboat. And there is, if it is carefully handled, a lighter side to forgetfulness. 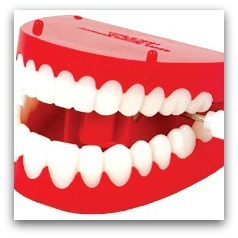 The rather good idea of inscribing an elderly person's dentures is inventive but bizarre and that's why, when my friend recounted his experience, there was some laughter — even if of the vaguely incredulous, half shame-faced kind. Part of the reason for this reaction is that, no matter how serious the context, teeth are forever on the brink of being comic, try as they might to rise above their Luna Parkish possibilities. The Goons understood that teeth, along with knees, were always battling for dignity and decorum in the chorus line of human body parts. Ondrej Jajcaj, a Slovakian living in Vienna, whom you may have come across in some fugitive news item, is certainly onto the wide-ranging possibilities of teeth. Jajcaj, feeling bullet-proof as we all do until we reach a certain age, was undeterred by the grisly rictus of which teeth are the main component when he targeted the teeth of the dead. And not teeth from your common or garden dead but from those of great musicians, Johann Strauss Jr and Johannes Brahms. He opened their graves and, the effluxion of time having made it unnecessary to open their mouths, stole their teeth. Describing himself as a 'Freedom Undertaker', Jajcaj built his archive from clandestine tours of the Vienna Central Cemetery, leaving a trail of opened — or, as Jajcaj might say, liberated — graves. This evidence was no doubt what aroused the suspicion and interest of Thomas Vecsey, a Vienna state prosecutor, though the fact that Jajcaj posted details of his Strauss/Brahms dental coup as a video on YouTube may also have had something to do with his growing notoriety. Well, next Thursday, I'll be off to see my coffee-drinking friend. He is going to tell me some news about the elderly woman whom he has, in his compassionate way, kept in touch with and continued to help as best he can. And I, for my part, once I get a word in, will segue seamlessly into the strange case of Ondrej Jajcaj, which he won't want to hear but won't be able to stop me telling him. And so we beat on through another week, 'borne back ceaselessly into the past'. Brian Matthews is the award winning author of A Fine and Private Place, The Temple Down the Road and Manning Clark — A Life. Before next Thursday and your meeting with your coffee-drinking friend, Brian, here's a brain-teaser for you to solve: Quand vous serez bien vieille, au soir, a la chandelle, Assise aupres du feu, devidant et filant, Direz, chantant mes vers, en vous emerveillant, Ronsard me celebrait du temps que j'etais belle. This incident is funny; the humour lies in the juxtaposition of the pathos, the ridiculous, the incongruous and the total surprise. Best of all we can laugh - uncomfortably - because it had a positive ending, especially as the "victim" found her own means of rescue. Black humour has always been a valuabe device for helping to bear the unbearable. And that is dementia: confusing, cruel, infuriating, undignified, heart breaking and threatening each one of us and society at large. It raises many ethical questions that ultimately society will need to find answers for. Good humour is always painful. Brings back memories of my grandmother, bless her soul; and of a nursing friend whose first job was to scrub dentures. She collected every set of dentures on the ward, scrubbed them, then went to return them only to realise she hadn't a clue which teeth belonged to which patient. You can imagine the chaos which ensued. ...in "Jajcaj" collection not only Brahms and Strauss but also Legendary Artists from Paris...??? As far as US politicians are concerned, blaming Batman for the massacre at Aurora is as good as hiding their heads in the sand. The larger issue is not violent entertainment, but gun control. Ironically, the Batman films take a decidedly thoughtful approach to violence in general, and gun violence in particular. A politician learns he has a degenerative neurological disorder. His marriage is a partnership where political expediency has long supplanted affection. His estranged daughter is a religious minister and wavering ex-addict. He exudes invincibility in public, while privately he is forced to confront his own mortality.